At the very center of the Earth is a solid lump of iron and nickel that might be as hot as the surface of the Sun. This solid core is thought to be why our magnetic field is as strong as it is. As the core grows, energy is transferred to the outer core to power the “geodynamo,” the magnetic field that protects our atmosphere and deflects most solar wind. 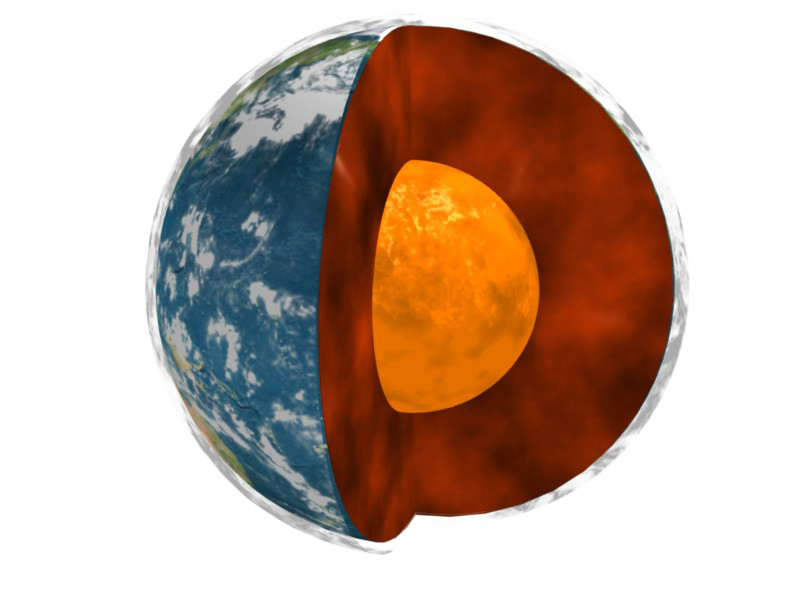 But geophysicists think that the core was originally completely liquid, and at one point between 2 billion and 500 million years ago, transitioned from molten metal to a solid. At that time, our magnetic field was much weaker than it is today, according to new research in Nature Geoscience. The scientists looked at new samples of crystals that first cooled from lava 565 million years ago and found evidence in their magnetic signatures that the core must have solidified at the younger end of the previously predicted range—much more recently than expected. Richard K. Bono, a co-author on the research and postdoctoral fellow at the University of Liverpool, explains how our core shapes magnetic fields and could even explain the existence of life on Earth. Check out the study in Nature Geoscience. Richard K. Bono is a research associate in Earth, Ocean and Ecological Sciences at the University of Liverpool in Liverpool, UK. JOHN DANKOSKY: This is Science Friday. I’m John Dankosky. If you learned any geology in grade school, it may have included this picture of the Earth, the rocky crust we walk on, and under that a solid, slowly shifting mantle; under that, a liquid outer core made of iron and nickel; and at the very center, a solid inner core also made of iron and nickel possibly as hot as the surface of the sun. But geologists also think that there would’ve been a time when that inner core was also liquid, when our planet actually formed with a fully molten core. And how they’re figuring out when that change happened? Well, it has a lot to do with our magnetic field. New research in nature geosciences tries to put a date on our solid core, suggesting this big change happened relatively recently in geologic time, just over 500 million years ago. Dr. Richard Bono is a postdoctoral researcher at the University of Liverpool in the United Kingdom. Well, Doctor, welcome to Science Friday. Thanks for being here. RICHARD BONO: Hi. Thank you for having me. JOHN DANKOSKY: So first of all, 500 million years is pretty young in geologic terms. Tell us about that. That is young, isn’t it? JOHN DANKOSKY: It’s recent. So why? Why are you concluding the solid core is so young? RICHARD BONO: So in our study, we looked at a few different things. Our work started with trying to understand the magnetic field itself, which is generated in the liquid part of the core. As the iron swirls and moves, it creates a magnetic field, which we see on Earth. And we looked in particular at the strength of this field. And we found that about 565 million years ago, the field was incredibly weak, about 10 times weaker than it is today. And then trying to understand the history of this field strength, we found that 500 million years ago and going further back, it started out at a strength similar to maybe how it is today. And then it was getting weaker and weaker until it was on the verge of collapsing at that time. And then we combined this observation with computer simulations about how the magnetic field could be generated and the core itself and how it would evolve and change to produce this magnetic field. And we found that these computer simulations that predicted a much younger inner core, one that’s about 500 million years old, is most consistent with our observations from the geologic rock record. JOHN DANKOSKY: So and I want to talk about that geologic rock record in a moment. But first tell us, how exactly does a solid core power this magnetic field? RICHARD BONO: So it’s in the transition from a liquid core to an inner core. It’s growing. And this growth actually changes the chemistry inside the core. And this chemical change, it’s a buoyancy. It’s like oil and water. And as it flows around, that helps drive the magnetic field in the liquid outer part. So it’s a chemically powered dynamo as it is today. JOHN DANKOSKY: And do we know how it solidified, exactly what happened? RICHARD BONO: That’s still a bit of an open question of exactly what the physics are that allows this inner core to start to grow. JOHN DANKOSKY: OK, so this all kind of sounds like magic to me, because I’m not quite sure how we’re looking at the center of the Earth 500 million years ago. Explain exactly how you’re doing this. RICHARD BONO: So this is one of the exciting parts about this type of research, which is called paleomagnetism. And that’s because we get to see the magnetic field on the surface of Earth. But it’s being generated much deeper in this outer core. So when a rock forms, there are tiny magnetic grains inside of it, in our case these little nanometer-sized magnetic needles. And when the rock cools below a critical temperature, it’ll lock in the magnetic field at that time and preserve it. And then we’re able to take that rock back to a lab and measure it. It’s much like a compass needle. It can tell us both what direction that the magnetic field is pointing, but also how strong it is. And that’s somewhat unique in that we’re able to peer both back in time, but also deep into the earth to where the magnetic field was being formed, even though we’re looking at the surface today. JOHN DANKOSKY: Why is it so important that we’re able to understand what’s going on at the center of the Earth, whether it’s 500 million years ago or today? RICHARD BONO: So our magnetic field is part of this picture that makes earth a special planet and one that has life and an atmosphere and liquid water, because the magnetic field acts as a shield that protects the Earth and its atmosphere from solar radiation. Without this shield, solar radiation, solar wind streaming from the sun can come and strip away the atmosphere and would allow for the water to leave. So this magnetic field and its history and its evolution is directly linked to our ability on earth for there to be life. So this is a critical connection. JOHN DANKOSKY: So it’s pretty important. Well, OK, so now let’s go back to this time 500-some million years ago when we’re looking at this gigantic dip in the magnetic field you were talking about. You explained that it’s 1/10 of the strength it is today. So what could that possibly have done to life on Earth at that time? RICHARD BONO: It’s hard to say exactly. We’ve never seen something that weak in the historical record where we have direct observations. But if the field was 10 times weaker than it is today, we’d expect that solar radiation would be able to penetrate much further into Earth, into the atmosphere. And that radiation could be harmful to life or to DNA. And there’s been some speculation about what that could mean about how life has evolved and changed in response to this increase in solar radiation. JOHN DANKOSKY: You’ve discussed, though, the possibility that the magnetic field didn’t just dip a lot, that it just completely went away at that time. Is there that possibility? RICHARD BONO: So we don’t have any evidence that the magnetic field completely collapsed or disappeared. It got very weak. But it is still above the minimum amount we would expect just from a sort of background signal. So it never completely disappeared. But it did get much, much weaker until something changed. And what we think that changed was that the inner core started to grow. And that allowed the geodynamo to be re-powered and to rise back up to what we see today. JOHN DANKOSKY: So what’s interesting here is this happened at around this time at which we also see the Cambrian explosion, all this life on Earth happening here. Maybe you can explain if there’s any sort of correlation here between this dip in the magnetic field and what happened with life on Earth at that time. RICHARD BONO: So there’s been speculation about that. It’s very difficult to try to directly connect something like the strength of the magnetic field to evolution on life. But it is intriguing that these are happening at about the same time. And it could be a relation. JOHN DANKOSKY: But before this happened, before this dip that we’re talking about here, what was powering the magnetic field of the Earth? So it was strong and then it was weak and then it was strong again when the core solidified. What was powering this beforehand? RICHARD BONO: So that’s another big question that our discipline is trying to address. There’s a lot of uncertainty. But one model is that it’s just due to cooling. And that’s a thermally powered dynamo. But this couldn’t last forever. And we would expect that as the core continues to cool, there’s less power available to drive the magnetic field. And it would get weaker and weaker until it would reach this point of collapse. And that seems somewhat consistent with what we’ve found in our study. JOHN DANKOSKY: Earlier in the hour, we were talking about the news this week that the magnetic north pole has actually been moving around a little bit. And it seems very scary to us. What do you see when you look at that? Is that something that concerns you? Is it something that you can learn anything from? What do you think when you hear that? RICHARD BONO: So I wouldn’t be concerned, but I’d be interested. So that’s one of the fascinating parts about our magnetic field is that it changes on all these different time scales. As we’re seeing in the study about the magnetic north pole, it moves around on yearly timescales. And it can also change on hundreds to thousands of years. There’s this what’s termed the South Atlantic Anomaly, a weak point on Earth’s field that we’re trying to understand if it’s hundreds or thousands of years old or even older, going back to millions and even billions of years. So it’s all these different timescales that it’s changing at that we’re trying to understand how and why and can we even predict it that remains a key part of our studies. JOHN DANKOSKY: We just have 30 seconds left. Mars doesn’t have a magnetic field? RICHARD BONO: It used to, but it doesn’t have one today from the best that we can tell. JOHN DANKOSKY: And what happened? Do we know? RICHARD BONO: We don’t really know. It’s this open question that hopefully some missions that will be looking at trying to collect samples might allow us to gain some insight into the history of Mars and its magnetic field. JOHN DANKOSKY: I love these big open questions. But there’s a lot of cool stuff in here. Thanks to Dr. Richard Bono, a postdoctoral fellow at the University of Liverpool in the UK. Thanks for joining us on Science Friday. RICHARD BONO: Thank you for having me. The term first appeared in an early “puzzle book” full of scientific brainteasers.